Prednisolone is a synthetic glucocorticoid, a derivative of cortisol, which is used to treat a variety of inflammatory and auto-immune conditions. It is the active metabolite of the drug prednisone and is used especially in patients with liver failure, as these individuals are unable to metabolise prednisone into prednisolone. 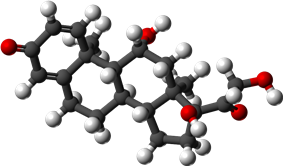 Prednisolone is a corticosteroid drug with predominant glucocorticoid and low mineralocorticoid activity, making it useful for the treatment of a wide range of inflammatory and auto-immune conditions such as asthma, uveitis, pyoderma gangrenosum, rheumatoid arthritis, ulcerative colitis, pericarditis, temporal arteritis and Crohn's disease, Bell's palsy, multiple sclerosis, cluster headaches, vasculitis, acute lymphoblastic leukemia and autoimmune hepatitis, systemic lupus erythematosus, Kawasaki disease and dermatomyositis. It is also used for treatment of sarcoidosis, though the mechanism is unknown. Prednisolone acetate ophthalmic suspension (eye drops) is an adrenocortical steroid product, prepared as a sterile ophthalmic suspension and used to reduce swelling, redness, itching, and allergic reactions affecting the eye. Prednisolone can also be used as an Addison's disease). Possible side-effects include fluid retention of the face (moon face, Cushing's syndrome), acne, constipation, and mood swings. A lengthy course of prednisolone can cause bloody or black tarry stools from bleeding into the stomach (this requires urgent medical attention); filling or rounding out of the face; muscle cramps or pain; muscle weakness; nausea; pain in back, hips, ribs, arms, shoulders, or legs; reddish-purple stretch marks on arms, face, legs, trunk, or groin; thin and shiny skin; unusual bruising; urinating at night; rapid weight gain; and wounds that will not heal. Prolonged use of prednisolone can lead to the development of osteoporosis which makes bones more fragile and susceptible to fractures. One way to help alleviate this side effect is through the use of calcium and vitamin D supplements. Swelling of the pancreas has also been reported. Prednisolone can cause increased blood sugar levels for diabetics. Other effects include decreased or blurred vision, increased eye pressure, increased thirst, cataract formation, confusion, rare cases of dementia in otherwise-healthy elderly patients, and nervousness. Loteprednol is an analog drug that has reduced adverse ocular effects. Nasal septum perforation and bowel perforation are also notable adverse effects that restrict steroids' use in some pathologic conditions. Prednisolone irreversibly binds with glucocorticoid receptors (GR) alpha and beta for which they have a high affinity. AlphaGR and BetaGR are found in virtually all tissues with variable numbers between 3000 and 10000 per cell, depending on the tissue involved. Prednisolone can activate and influence biochemical behaviour of most cells. The steroid/receptor complexes dimerise and interact with cellular DNA in the nucleus, binding to steroid-response elements and modifying gene transcription. They induce synthesis of some proteins, and inhibit synthesis of others. Regulation of gene suppression leads to systemic suppression of inflammation and immune response. This is of clinical usefulness but ultimately leads to gluconeogenesis, proteolysis and lipolysis. Gene transcription returns to normal after cessation, but sudden stoppage can cause Addison's disease. Osteoporosis is permanent. ^ Davis M, Williams R, Chakraborty J, et al. (June 1978). "Prednisone or prednisolone for the treatment of chronic active hepatitis? A comparison of plasma availability". British Journal of Clinical Pharmacology 5 (6): 501–5. ^ Czock D, Keller F, Rasche FM, Häussler U (2005). "Pharmacokinetics and pharmacodynamics of systemically administered glucocorticoids". Clin Pharmacokinet 44 (1): 61–98. ^ Fiel SB, Vincken W (Jun 2006). "Systemic corticosteroid therapy for acute asthma exacerbations". J Asthma 43 (5): 321–31. ^ Thrower BW (Jan 2009). "Relapse management in multiple sclerosis". Neurologist 15 (1): 1–5. ^ Lambrou GI, Vlahopoulos S, Papathanasiou C, Papanikolaou M, Karpusas M, Zoumakis E, Tzortzatou-Stathopoulou F (2009). "Prednisolone exerts late mitogenic and biphasic effects on resistant acute lymphoblastic leukemia cells: Relation to early gene expression". Leuk Res. 33 (12): 1684–95. ^ Miura M, Tamame T, Naganuma T, Chinen S, Matsuoka M, Ohki H (2011). "Steroid pulse therapy for Kawasaki disease unresponsive to additional immunoglobulin therapy". Paediatrics & Child Health 16 (8): 479–84. ^ "prednisolone, Pediapred Oral Liquid, Medrol (cont.)". ^ a b Drugs Information. "Prednisolone Tablets 1mg, 5mg (Actavis UK Ltd)". Retrieved 13 December 2012. ^ "Bowel Perforation in Steroid-Treated Patients"
^ "Intranasal steroids and septum perforation--an overlooked complication?" ^ a b Kaminstein, David. "Steroid Withdrawal". medicinenet. Retrieved 23 December 2012. ^ Prednisolone. Australian Medicines Handbook 2010. Adelaide: Australian Medicines handbook Pty Ltd.; 2010. 497, 598. ^ Rang HP, Dale MM, Ritter JM, Moore PK. The pituitary and the adrenal Cortex. Hunter l, editor. Pharmacology. 5th ed. London: Churchill Livingstone; 2003. 413, 415. ^ "The 2011 Prohibited List".